Regional publisher Johnston Press has sold four more of its current and former newspaper offices, raising millions of pounds in additional revenues. As HTFP reported in November, the publisher has created a dedicated website to market current and former newspaper buildings for sale in a bid to raise more than £8m and ensure its remaining offices are “fit for purpose”. It has now been confirmed that at least four more have been sold, with a major former printworks site in Peterborough also under offer. Although the company has declined to reveal details of the value of the sales, they are understood to exceed £2m. The 5.5 acre former newspaper office and print works on Oundle Road, Peterborough, which once housed the Peterborough Telegraph, was marketed without a guide price and is expected to be sold for redevelopment. 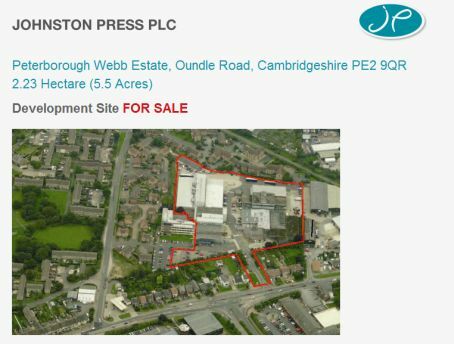 The site, which closed in 2012, is under offer but Johnston Press said contracts had not been signed yet. Meanwhile the current base of the Wigan Evening Post and Wigan Observer has been sold and part of the site being leased back by the paper, with staff at the title continuing to be based there. The property on Martland Mill Lane in Wigan, which also did not have a guide price, has been a base for the Lancashire titles since the early 1980s and includes a now-defunct press hall. As reported by HTFP last week, the Morecambe Visitor offices in the town, which were up for sale for £350,000, have been sold to a charity with staff from the Visitor and sister title the Lancaster Guardian moved to a new base on an industrial estate. Other buildings sold by the company include the former Mansfield Chad offices, which were marketed for £450,000, a former Portsmouth News office in Gosport, which was up for sale for £225,000 and the former Nelson Leader offices, which were valued at £90,000. The Mansfield Chad left its former Newgate Lane base after 39 years last summer to move to new offices in a business park and it is understood that a neighbouring care home has bought the site. The News’ office in Gosport and the Nelson Leader’s base were also vacated by the regional publisher last year. HTFP has previously reported the sales of three other properties listed on the JP website, namely the former offices of the West Sussex County Times in Horsham, the former offices of the Southern Reporter in Selkirk, and a newspaper office in Kelso. A spokeswoman for Johnston Press confirmed that the sales had taken place but declined to comment further. in Lincolnshire. Some are virtually uninhabitable! Observer – you’re not living in the office, are you? Be careful what you wish for. The JP solution to the problem of unfit for purpose offices is to close them down and move staff miles away. Staff/visitor parking then also becomes an issue. In the future JP may own very little and be at the mercy of their landlords. Selling the offices because they are not fit for purpose, but then leasing them back. Have I missed something? Three words spring to mind. Debt. Drop. Ocean. You beat me to it Scribbler. This is a pittance to what they owe. £8m will probably not even cover the interest outstanding on their deal with the banks. Sold – then what? Can’t sell ’em again. So, sell assets as quickly as you can for whatever you can get (I can’t believe the charity in Morecambe have broken their bank) to then take on extra costs for the new premises that you have to rent. Sounds a bit short-term (aka desperate) to me. Eighteen months ago I asked the JP Pension Trustee what steps were being taken to safeguard the interests of the Pension Plan in the context of this wholesale disposal of capital assets. I never got an answer. @stifled. I have it on good authority that Galloways paid a five figure sum for the Visitor office. While it is true that in the digital age fixed assets like premises, and materials and stock are not ‘fixed’. Some assets exist only fleetingly as a bit-stream. We can’t beat up JP over that as it is also what frees its ex-staff to develop new incomes and businesses with no more than their VR in their pocket. But Jon Young raises an important point. With a declining market, unpredictable future profitability, no assets in the form of property, reliance on others for premises and printing, the majority of your staff contracted out or casual un-salaried amateurs, AND you are leveraged to the hilt, how do you value a company like JP? The share price has risen remarkably but should we be worried that before the recession came the dot.com bubble?